1. Lower the rear headrests to the lowest position. 2. 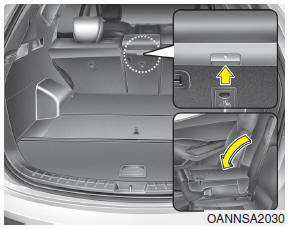 Push the center seatback folding lever up, then fold the seat toward the front of the vehicle. When you return the seatback to its upright position, always be sure it has locked into position by pushing on the top of the seatback. The rear center seat back does not fix when it is folded. If you use the rear center seat back folding function to carry long objects, you should secure the long object to prevent it from being thrown about the vehicle in a collision and causing injury to vehicle occupants. Be careful not to damage the seat belt webbing or buckle. Do not allow the seat belt webbing or buckle to get caught or pinched in the rear seat. Ensure that the seatback is completely locked into its upright position by pushing on the top of the seatback. Otherwise, in an accident or sudden stop, the seat could fold down and allow cargo to enter the passenger compartment, which could result in serious injury or death. When you return the seatback to its upright position, hold the seatback and return it slowly. If the seatback is returned without holding it, the back of the seat could spring forward resulting in injury caused by being struck by the seatback. When returning the rear seatbacks to the upright position, remember to return the rear shoulder belts to their proper position. Cargo should always be secured to prevent it from being thrown about the vehicle in a collision and causing injury to the vehicle occupants. Special care of objects should be taken when placing them in the rear seats, since those may hit the front seat occupants in a frontal collision. Make sure the engine is off, the automatic transaxle is in P (Park) and the parking brake is securely applied whenever loading or unloading cargo. Failure to take these steps may allow the vehicle to move if the shift lever is inadvertently moved to another position.